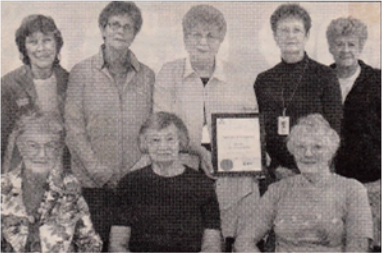 left to right, back row: Elizabeth Mann, Margaret Dietrich, Trudy Demorest, Jeannette Stapleton, Elaine Madaire. Front row: Lois Clark, Mary Clare Bednarik, Kay Yuckin. Missing from the picture is Adeline Frey, Merrill Bjerkan and Trish Soare. Dietrich and Stapleton are from Osoyoos and the other members are from Oliver. In 2005, a group of hospice volunteers saw a need and discussed the practicality of starting a Society in order to accumulate and direct fundraised dollars as the society saw fit. The practice at the time was for fundraised dollars to be directed to the hospital’s foundation. In January 2007, the Society became a registered charity. The Society’s goals at the time were to raise awareness around hospice palliative care, and to fundraise to build a freestanding hospice house. The Society had very good success in fundraising through different events including large annual events like the Hike for Hospice Palliative Care, and an annual wine & cheese and auction, as well as smaller events including membership drives, car washes, and a fashion show among others. From the beginning, the communities of Oliver and Osoyoos have been very supportive, with many businesses and organizations donating funds and / or proceeds from their events. At the September 2008 annual general meeting, two new directors came on board: Hank O’Handley, Special Projects Coordinator and Adeline Frey, Director. In 2011, the Board of Directors recognized the critical importance of developing a Strategic Plan to guide the work of the Society. Without a strong framework from which to work, the Board believed it would struggle to achieve the Society’s mission and values. The Board engaged a consultant to help establish the Strategic Plan. As part of the first phase of the project, an assessment of the current end-of-life and Palliative Care services in the South Okanagan Local Health Area was conducted. The state of care was measured against Provincial and Interior Health expectations. The assessment determined a current need for six Palliative Care beds, a need which was expected to grow to 10 beds within 15 years. From this assessment came a Business Case Proposal to establish a free standing six bed Hospice House, commissioned in 2012. In 2012, a three year Strategic Plan was completed. As well, a service contract between DVHS and Interior Health was signed allowing DVHS to provide Hospice volunteer programs within Interior Health. Currently, Palliative Care is provided in the hospital setting in two dedicated Palliative Care beds and in the acute care ward as necessary by a team consisting of the Palliative Care nurse, hospital nursing staff and trained Hospice Volunteers. In addition, Hospice care is provided co-operatively from Hospice Volunteers and the Palliative Care nurse and staff in care facilities, as well as at the homes of individuals. Although fundraising for a Hospice House remains important, DVHS is also committed to advocating for excellence in end-of-life care within Interior Health and the community at large. The Strategic Plan also helps DVHS develop a better profile in the community from which to create awareness of the Society and its goals. One of our key strategic objectives included the need to establish and maintain a supportive care centre from which the society could operate. With the support of the provincial government and BC Housing, DVHS has secured a three year agreement effective September 1 2014 to operate a supportive care centre at 22 Jonagold in Osoyoos. The building will be used initially as a home for the society and will be used for administrative purposes, education and training space for hospice volunteers, meeting space for the board, its committees , staff and program development and delivery. The agreement includes operating subsidies to DVHS. Future uses will be developed as sustainable funding becomes available.